Ye Qing Wei, a housekeeper at Sheraton Boston, has seen her schedule disrupted by green programs that encourage people to opt out of housekeeping service in exchange for points and meal coupons. For hotel guests who care more about saving water and electricity than they do about clean towels and a freshly scrubbed tub, opting out of housekeeping seems like the right thing to do. The incentives offered to some of those who decline cleaning services — rewards points, restaurant discounts, even having a tree planted — make it even more enticing. But the housekeepers who would otherwise be cleaning these rooms, many of them immigrants, say the increasingly popular programs are cutting into their livelihoods by reducing their hours, making their schedules more erratic, and — ironically — making their jobs harder. That’s because rooms that go without housekeeping for several days are often a wreck — trash piled up, shower doors coated in gunk, crumbs in the carpet, and hair everywhere. 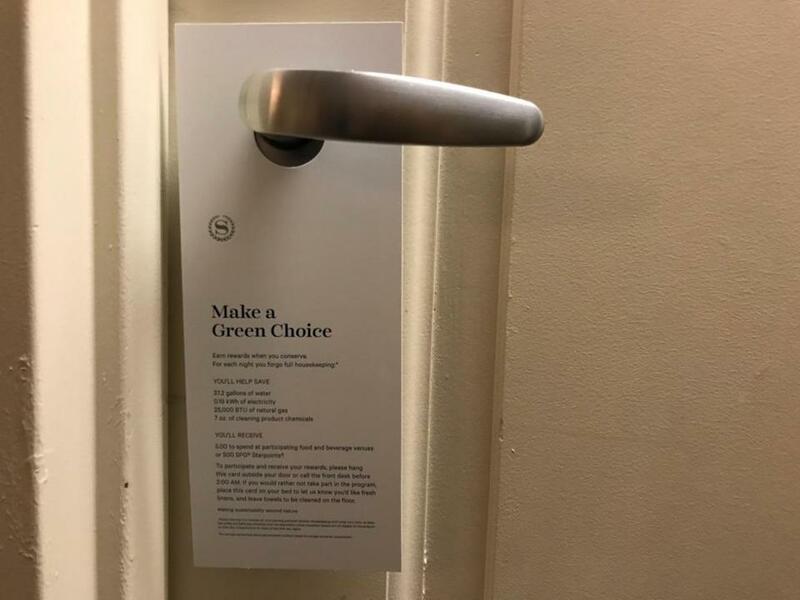 The Make a Green Choice sign Sheraton Boston hotel guests can hang on their door to opt out of housekeeping. The “green” initiatives, embraced by the world’s largest hotel company, Marriott International, and other chains, are at the heart of a contract battle between local hotels and hospitality union Unite Here Local 26, which claims they are cost-cutting measures in disguise. Housekeepers who belong to Local 26 make $21.45 an hour and have a pension plan and generous health care coverage with no copays or deductibles, according to Brian Lang, president of the union. But the housecleaning programs are taking a toll. At Marriott’s Sheraton Boston Hotel, the “Make a Green Choice” sign that participating guests hang on the door handle details what will be saved each night they opt out of housekeeping: 37.2 gallons of water, 0.19 kilowatt hours of electricity, 25,000 BTUs of natural gas, and 7 ounces of cleaning products. But some groups question just how environmentally friendly these money-saving programs are. The Peoples Climate Movement, an environmental and social justice group based in New York, has a word for it: greenwashing. Caught in the middle are hotel guests who want to do their part to protect the planet — or simply don’t want anyone to come into their rooms — but don’t want to hurt workers. 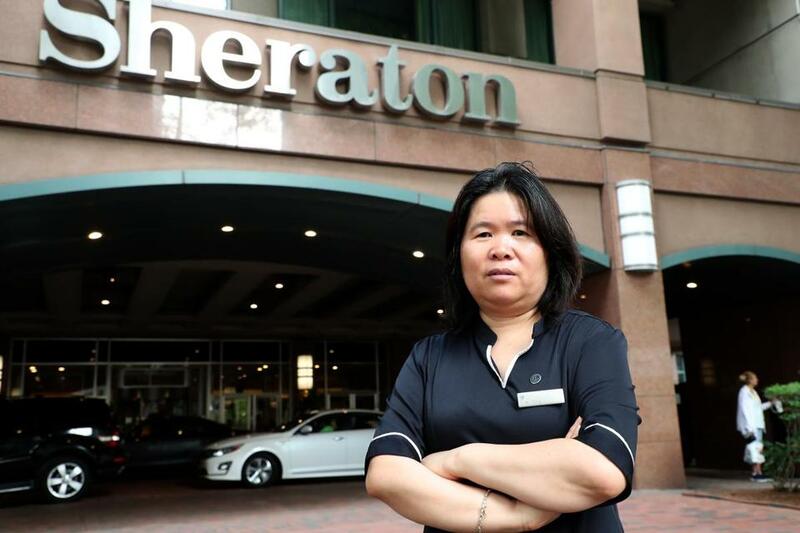 Ye Qing Wei has been cleaning rooms at the Sheraton for 13 years and still has no set schedule, a more common occurrence for longtime workers following the emergence of these programs, according to the union. 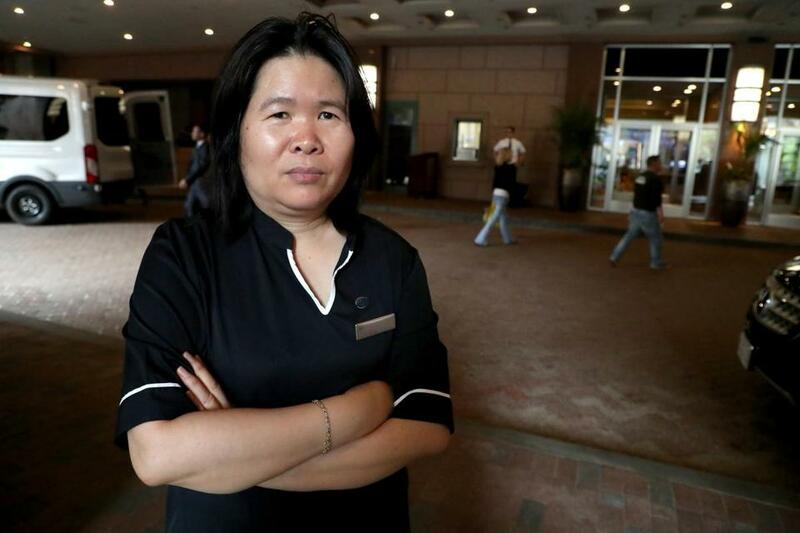 Ye Qing Wei has been cleaning rooms at the Sheraton for 13 years and still has no set schedule, a more common occurrence for longtime workers following the emergence of these programs, according to the union. Instead, Wei often works on call, keeping her phone by her side in case the hotel contacts her, sometimes just an hour or two before a shift begins. Wei, 50, has canceled doctor’s appointments and missed her children’s birthdays in order to pick up last-minute shifts. Sometimes, she doesn’t get 40 hours of work a week, which has been happening more frequently as more people skip housekeeping. At Marriott, which has 18 properties in Boston, eight of which participate in the “Make a Green Choice” incentive, guests get a $5 food or beverage voucher or 250-500 rewards points in its loyalty program for each night they opt out of housekeeping — capped at three consecutive nights. Marriott declined to say how often cleaning service is turned down but noted that 20 of its 30 brands worldwide offer the program. Other Marriott hotels in the city include the Westin Copley Place, W Boston, and Aloft Boston Seaport District. Between 2007 and 2016, before Marriott bought Starwood Hotels and Resorts, which has a similar program, Marriott said it lowered its energy use by 13.2 percent, greenhouse emissions by 15.8 percent, and water use by 7.7 percent. Local 26 estimates that among the six unionized Marriott hotels in Boston that participate in the green program, there were 89,000 Green Choice room nights in 2016, based on data provided by the company during contract negotiations. The same year, workers at four of those hotels worked 157,909 fewer hours than they did in 2012, according to the union, even as occupancy rates rose across the city. Hotels have been offering guests the option to reuse their sheets and towels for approximately 25 years, but the option to turn down all cleaning services has taken off only recently, said Bjorn Hanson, a hospitality consultant and professor at New York University. The trend was started by guests who wanted privacy, he said, not by hotels’ environmental concerns. But when hoteliers noticed its popularity, they saw a way to deal with labor shortages and save money on payroll at the same time. Some hotels that have seen guests turning down housekeeping, including the Lenox, assign workers to other cleaning duties — “a shifting of time as opposed to reducing time,” said Tedd Saunders, chief sustainability officer for the Saunders Hotel Group, which owns the hotel. The hotel doesn’t offer a program encouraging guests to refuse housekeeping. Sorinelda Pabon, a housekeeper for nine years at the Westin Boston Waterfront, said she, too, sleeps with her phone to ensure she doesn’t miss a work call. She sometimes takes a shift ending at 11 p.m. and goes in the next morning at eight in order to cobble together enough hours. But she still doesn’t get as many as she once did. Pabon, a 56-year-old native of the Dominican Republic who gets cortisone shots to ease the pain in her hands, worries that as these kinds of programs get more popular, fewer housekeepers will be needed. And hotel guests may not realize that making an environmentally conscious choice could affect people’s jobs.